I love waking up in the morning to find a new recipe in my inbox and one that I can’t wait to make. 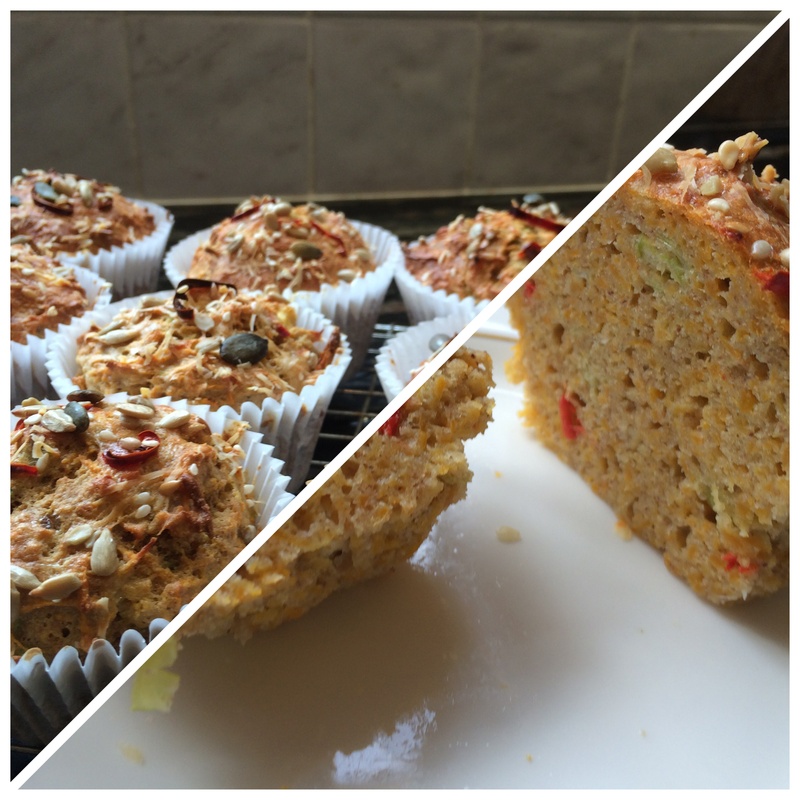 This Sweet Potato Muffin recipe really tickled my taste buds and I couldn’t wait to get down into the kitchen to have a go. I altered it slightly as my husband is wheat intolerant so I substituted buckwheat flour and a teaspoon of baking powder for the SR wholemeal flour and it worked well. I also keep a stock of Crunchy Trail Seed Mix in my store cupboard and this was perfect for sprinkling on the top. Line a 12 hole muffin tin with either paper cases, 15cm folded squares of greaseproof paper or silicon cases, then lightly wipe each with oiled kitchen paper. Peel the sweet potato or squash and coarsely grate into a large bowl. Crack in the eggs, add the cottage cheese and flour and baking powder, then finely grate in most of the Parmesan. Season with sea salt and freshly ground black pepper. Mix until nicely combined. Evenly divide the mixture between the cases. 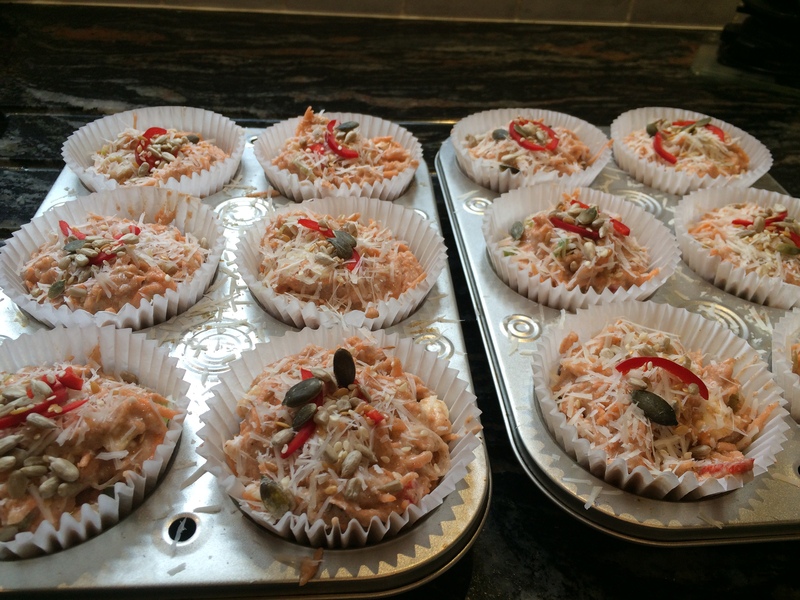 Sprinkle over the seeds, then dot over the reserved pieces of chilli. Use the remaining Parmesan to sprinkle over each muffin. Bake at 180°C/350°F/gas 4 for about 45 to 50 minutes, or until golden and set. These are really amazing served warm 5 minutes after taking them out of the oven, and it is quite hard not to eat more than one or two. They will keep in the fridge for a couple of days. Recipe courtesy of Jamie Oliver. This entry was posted in Breakfast, Brunch, Supper, Sweets and Treats and tagged Breakfast, Buckwheat, Gluten Free, Healthy Eating, Lunch, Muffins, Sweet Potato, Wheat-Free. Bookmark the permalink.